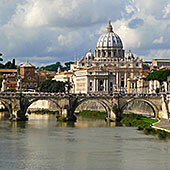 From Marvelous Milan to Rapturous Rome!. Read on . . .
For my journey through Italy, I chose to go my whole way by Rail. Simple, convenient, economical, safe, relaxing and molto comfortable, thanks to the terrific Eurail Pass and their outstanding Public Relations guru, Samina Sabir. It’s like having your own magic carpet. I heartily recommend it. My Eurail Pass eased me into my first journey from Milan’s Central Station to Rome’s Termini in just under three hours. Time to make final plans for the next three days and to read a book on my iPad. 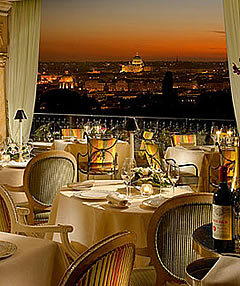 At trip’s end, I caught a taxi to the heart of this great city, up the famous Via Veneto to the tip of the Borghese Gardens to the "Hotel Splendide Royal Roma", part of the Roberto Naldi Collection of great hotels. I saved the Vatican and other sites for other days. But I had staked out my last night’s dinner at the "Splendide Royal’s" elegant Mirabelle Restaurant under the stewardship of Bruno Borghesi. This was my ‘dress up time’ in one of Rome’s finest eateries with its softly lit furnishings, gorgeous fresh flowers, sparkling crystal and antique porcelains. All a perfect setting for the excellent dinner prepared by Executive Chef Stefano Marzetti. Maitre d’ Mauro Porcacchia greeted me and led me to a table outside on the long open terrace where Rome at night in all its glory from the Borghese Gardens to The Vatican stretched before me. And the feast began starting with a crisp, cold spumonte, Franciacorta Nature to accompany an escalope of fresh foie gras on a delicious ginger bread topped with chopped fruits. Pity the poor goose; pity the poor diners who can no longer taste this stunning dish. After a full year of re-structuring a 19th Century palace, which was the headquarters of Rome’s Maronite community, my home away was now a 5-star hotel which easily lived up to its rating. By the way, the Maronites are part of an Eastern Catholic church founded in the 4th century. And, of course, with the Vatican a short ride from my hotel, to the Maronites there’s no place like Rome. (Scusi for the pun!) Rome’s "Splendide Royal" echoes the exuberance, and grandeur of the Baroque Period that swept over most of Europe in the 1600’s and is still evident throughout the city. 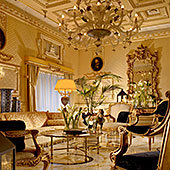 The hotel’s furnishings from elegant seating to brocaded wall panels to marble floors to the glorious Murano glass chandelier in the main hall express the drama of the Baroque. By the way, that chandelier co-starred in Luchino Visconti’s ballroom scene for his thrilling film “The Leopard” (also starring my late friend Burt Lancaster). 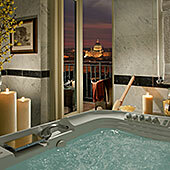 The perfect hotel for this magnificent city Rome. Much of my three days was spent renewing my friendship with the Rome where I lived and worked for almost a year in the 80’s. I must have walked fifty miles from the "Splendide Royal" into the Borghese Gardens with its splendid museums to Piazza del Popolo with its Egyptian obelisk in the center then along Via del Babuino to the lively Spanish Steps, down Via Condotti with dozens of luxury shops, down to Piazza Navona with its magnificent fountains. I walked across to the Pantheon with its remarkable Rotonda and then stood looking down at the Tiber River and went along the endless road passing the Vittorio Emanuele II monument (nicknamed ‘the wedding cake’), the Roman Forum to the Coliseum. On the way back to my hotel, I had to stop at the Trevi Fountain where I flipped in a coin to assure my wife's return to Rome. A 2009 Muffo helped me devour a golf ball sized scallop with white truffles which was followed by ravioli stuffed with cod fish and surrounded by more white truffles. At least they’re politically correct. Last course was a melt-in-my-mouth medallion of veal on a lake of potato puree and (you guessed it) white truffles. A Tuscan Belnero ’09 was my wine of choice. And finally an assortment of intensely flavored sorbetti – strawberry, lemon and passion fruit (who needs truffles!) What a meal to set before King David!